Turkey, and Istanbul in particular is the place to be for the Euroleague Final Four but it is also the place to be with respect to Game 4 in the Euroleague. There are two matches in this stage of the tournament, both taking place in Istanbul on Friday night. This means it will be a bustling place for basketball fans but this isn’t unusual in a city that has a tremendous passion for basketball. There is one Istanbul side already in the Final Four and on Friday evening, two more Istanbul sides are fighting to keep their dreams alive. Anadolu Efes are the team more likely to book their place because they know with a home win, they will have won this series. The Turkish team fell to a 15 point loss in Greece in the opening game of the series but bounced back strongly to win the second game by two points. In Game 3, here in Istanbul, Anadolu triumphed again, this time by a four-point margin. In this regard, six points, the combined winning margin for Anadolu over two games, is stronger than the 15 point margin Olympiacos Piraeus have enjoyed in their one victory so far in the series. The Greek side are in the last chance saloon for this game and they know a loss ends their participation in this season’s Euroleague. The Wednesday game was a close run thing with Vassilis Spanoulis scoring 3 three-point shots to bring the score to 61-60. However, Thomas Heurtel and Tyler Honeycutt prevailed and the Turkish team held the upper hand at the end of the match. Bryant Dunston provided 16 points and 9 rebounds in the win, Heurtel offered 13 points, Derrick Brown grabbed 12 points, Jayson Granger offered 11 points and Honeycutt’s contribution was seen with 6 points, 7 rebounds and 4 steals. Spanoulis offered 15 points and 7 assists in the game but 9 of these points and 3 of these assists came in the final six minutes of the match. 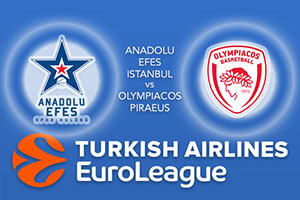 This has the makings of a close game again so take Anadolu Efes Istanbul at -1, which is provided at odds of 1.90. If you’re looking for the Over/Under market, go UNDER 148.5 on offer at odds of 1.90. Bet Now!